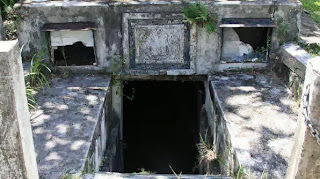 A series of unexplained incidents took place at the Chase Vault, in the cemetery of the Christ Church in Oistins, Barbados. Each time the vault was opened to bury a family member, all coffins but one had changed position. When this had happened several times without explanation over a number of years, the vault was eventually abandoned. The vault, located about seven miles from Bridgetown, was a large structure built for the Chase family and their close friends. The vault was built roughly half above and half below the ground, which allowed for some degree of protection from the elements. The Chase Vault was first built by The Honorable James Elliot. The vault was majestic, made of carved stone, coral, and concrete walls over two feet thick. At the entrance was an enormous blue slab of marble sealing the tomb in peace. The first occupant of the vault was James Elliot's wife, Elizabeth, who died on May 14th, 1792. A few years later, the vault was purchased by the Walrond Family. The first placed inside the vault from was Mrs. Thomasina Goddard from this family. She was buried in a simple wooden coffin built in July 1807. The vault eventually ended up in the possession of the Chase Family (hence the name) and the first member of the Chase Family to be buried there was baby Mary Anne Chase who died at the age of two on February 22, 1808. The older sister of Mary Ann, Dorcas Chase, was put into the vault on July 6, 1812. Some claim that Dorcas starved herself after she was forced into depression by her father. A few weeks later her father, Thomas Chase, died and was to be placed into the vault. Legend says that Thomas was one of the most hated men in Barbados. When the Chase Vault was open for the burial of Thomas Chase, the eight pallbearers who carried Chase's coffin down into the vault were the first to notice that the two lead coffins already in the tomb were not where they had been left a month earlier. Mary Ann's coffin was lying upside-down in the opposite corner from where it had been placed. The workers returned the coffins to their side-by-side positions and left that of Thomas Chase next to them. The smaller coffin of Mary Ann was placed on top of one of the larger ones. After the crypt was resealed with its heavy marble door, a curious murmuring started amongst the Bajans. The mourners soon resolved to place the blame on the slaves who had assisted in the burials. The alleged cruelty of Thomas Chase toward his servants offered an easy revenge motive. The case apparently having been solved, the crypt remained undisturbed for four more years. On September 25, 1816, the vault was opened for the burial of eleven year old Charles Brewster Ames. As with the previous time the vault was opened, each of the coffins were misplaced and thrown about, including the two hundred forty pound coffin of Thomas. The vault was put back in order and resealed. Fifty two days later, Samuel Brewster was to be buried inside the Chase Vault. This time, a large group of witnesses crowded around the vault, looking for the mystery to continue. The slab of stone, which covered the door, was carefully examined. No defects were found, and the vault was opened. The vault was once again found in disarray. Mrs. Goddard's coffin, the only wooden one placed in the vault, was badly damaged, and was later wrapped in wire to keep it together. Several investigators, including the Reverend Thomas Oderson, examined the vault. Nothing could be found that would indicate a cause for the strange happenings, so the vault was once again cleaned and sealed. On July 17, 1819 the vault was once again opened, and once again the vault was found to be in disorder. The only coffin untouched was the wooden, and fragile, one of Mrs. Goddard's. This time, the governor of the island, Lord Combermere ordered his own professional investigation. The entire vault was looked over, and nothing strange could be found. The coffins were restacked with Mrs. Goddard's wooden coffin being stacked against a wall, as it was so frail. Sand was placed on the floor to catch the footprints of the perpetrators. The vault was then re-closed, and personal seals of the governor were placed on concrete. Everyone of the island awaited the next reopening. The next opening of the vault was not for a burial, but for the governors curiosity. On April 18, 1820 the governor and several friends traveled to the vault and found his seal unbroken. When the vault was opened, however, it was found that the coffins were in disarray; some even flipped upside down! The sand revealed no footprints. After this incident, the vault was abandoned, and the coffins were buried elsewhere. The vault still exists today at Christ Church Parish Church, and is still vacant.